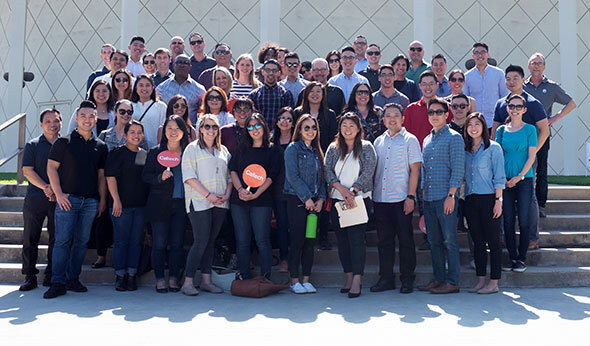 On Friday, June 8, the Andrew and Peggy Cherng Department of Medical Engineering was honored to welcome the marketing team from Panda Restaurant Group. The team, led by Chief Marketing Officer Andrea Cherng, was welcomed by Ravi Ravichandran. Andrew and Peggy Cherng Medical Engineering Leadership Chair, Y.C. Tai, provided an overview of medical engineering at Caltech, and Andrea also gave remarks before the group toured the laboratories of professors Y.C. Tai, Azita Emami, Lihong Wang, and Wei Gao. Founded in 1973, the privately-held Panda Restaurant Group is the world's leader in Asian dining experiences with over 2,000 locations and over 37,000 associates. The successful chain of concepts includes Panda Express, Panda Inn and Hibachi-San. As an organization, Panda is committed to its mission to inspire better lives which are guided by the core values deeply rooted in its founders.